EasyCart allows for flexible email setup and configuration to make sure your customers account and order emails are sent and received. EasyCart offers a native emailing system but can easily be switched to wordpress for sending email. Should you still have any issue with email sending, we recommend you use WordPress to send email and setup an SMTP plugin for authenticated email. It is a bit more steps to install and configure SMTP, but because it’s authenticated, it can be much more reliable. One thing we hear a lot of from customers is that wordpress never delivers the emails sent out from EasyCart, so here are the steps to solving most email delivery issues. Try changing the global email system here to WordPress Email system. Test it. This allows your EasyCart to use whatever methods your WordPress system is setup to send email. If this does not work, we recommend installing one of the many freely available SMTP plugins, such as ‘Postman SMTP‘. This allows you to send authenticated email from wordpress AND it offers a log file, so you can see if the emails are actually leaving the site. Test it. Those two will likely fix nearly any email delivery issue. Remember, your hosting plays an important role in email delivery. They most likely are being sent from EasyCart, but it becomes an email routing and delivery issue. Low cost shared hosting can have thousands of other websites on it and can be blacklisted as well, causing other email serves such as yahoo, gmail, and microsoft to block your entire server. Be sure to check any blacklists and that your domain is not on them. Also, many servers have trouble testing and routing emails directly to themselves. Try using external Gmail or Outlook email accounts to get a true user experience from your website. As with all things in web design, and as a wordpress operator, test, test, test! Your website is unique and you have themes and plugins nobody likely has ever combined, so test, test test! Choose Global Email System to Use: Choose either EasyCart or WordPress to send emails. WordPress will utilize whichever methods it is setup to use, whether that be native WordPress, an SMTP plugin installed, etc. If you experience trouble with EasyCart sending email, switch and leave this on WordPress for sending. 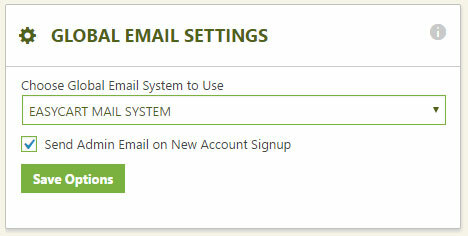 Send Admin Email on New Account Signup: Choose to send admin users an email on each account creation in EasyCart. Use SMTP Server to send order receipts: You can setup SMTP authentication here to send order receipts specifically from an SMTP server. A more popular option is to use your global email settings. Switch and use WordPress email global system, and then install an SMTP plugin to send and log emails. Admin Email Address(es): You may add an email address in this location who will receive the same order receipt that the customer receives. You may separate these email addresses by a comma to add more admin receivers if you like. Show Email Address on Receipt Email: If enabled, the users email address will appear on the email within the body of the message. Show Product Images on Receipt Email: If enabled, the product image will appear along with the product title and pricing for each item. Next Order ID: You may adjust this database auto increment value to a larger integer if you need. It must be an integer and it must be larger than what is already entered to insure you do not have bad data. 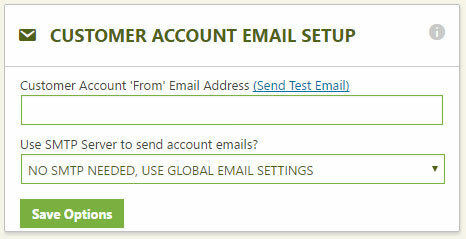 Resend Order Email Test: A good way to test order emails is to resend them using this section. 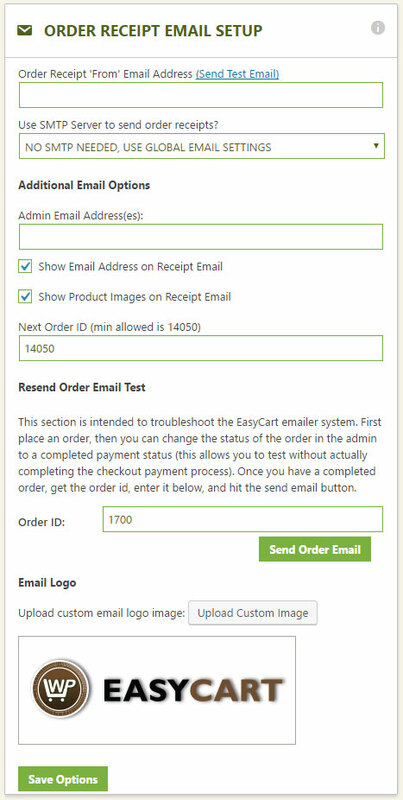 Just enter the order # and hit ‘Send Order Email’ and EasyCart will dispatch the emails to the customer and admins again. Great for testing. Email Logo Upload: This section lets you upload a unique logo for your customers emails. Use SMTP Server to send account emails: You can setup SMTP authentication here to send password resets specifically from an SMTP server. A more popular option is to use your global email settings. Switch and use WordPress email global system, and then install an SMTP plugin to send and log emails. 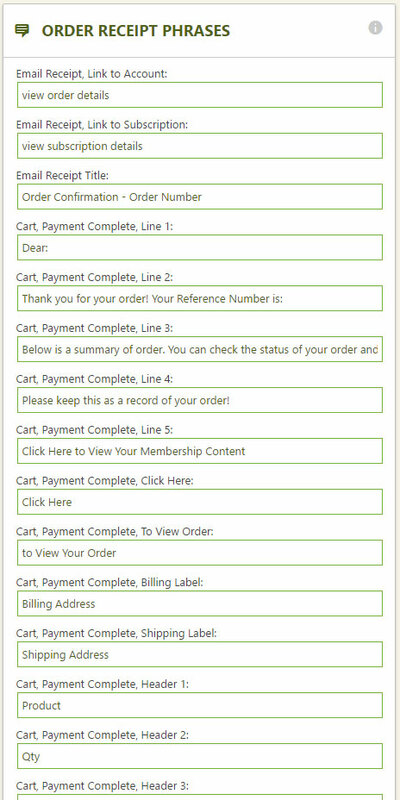 This section lets you adjust the order receipt phrases and paragraphs without having to manipulate a coded page. You can easily manipulate the entire language of the email in this location, but should you need further customization, you will want to visit our design template section to make child theme/layout of the email.